I have kept the process as simple and hassle free as possible, and you can use quickFilters Pro on as many Thunderbird installations as you like as long as it has your registered email address on it. Also, the email address is not given to any third parties, it is only used for order fulfillment and license verification. Premium features are power functions which are an incentive for users to regularly support the quickFilters project through a yearly contribution, called quickFilters Pro license. My aim is that instead of very few people trying to carry the project with sometimes large donations to try involving more supporters. It is a lot of work to keep the project going and up to date with all the latest code changes which happen every 6 weeks on the Mozilla code base. Staying in sync with the three applications (Thunderbird, Postbox and SeaMonkey) and to support multiple platforms (Windows, Linux and Mac) and languages and writing support emails and fixing bugs is actually a lot of work. I would rather actually spend more time on this as opposed to maybe 6 to 12 hours / week, but for this it needs to be financially viable. 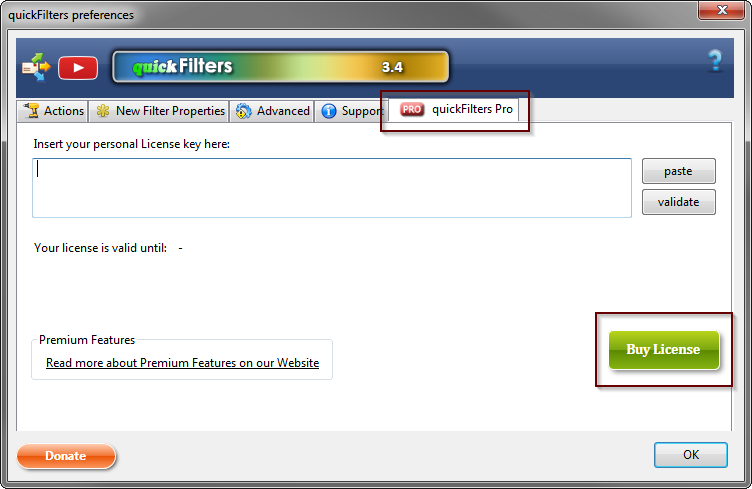 Here is a list of Premium features that are unrestricted to licensed users of quickFilters Pro. Otherwise you may find your emails in unexpected locations: An email that has already been moved away from the Inbox will not be treated by the following filters. There is also an option on the "New Filter Properties" tab that enables to insert new filters in alphabetical order. This will work best if the existing list of filters is already sorted alphabetically. This is becayse it will not "look ahead" beyond alphabetically lower entries and attempt to insert the new filter after them. Custom Templates These "Advanced Templates" can be created from the Advanced tab of the quickFilters preferences dialog. These are new filter templates that will then show up during the filte assistant process as choices for new filters. They will preselect & prefill some filter conditions based on a big number of mail attributes. Custom Templates are stored like standard filters but are located in the "Local Folders" account and have the string "quickFilterCustomTemplate" in the start of their name. The rest of the name is what is shown in the assistant dialog. [Available from version 3.5] - you can now save your filters for each mailbox to a file and load them later or transfer to a different Thunderbird profile. For technical reasons, currently old filters will not be overwritten - therefore unwanted filters should be removed manually after restoring to avoid duplication. When transferring to a different profile, Custom filter actions (e.g. create with FilteQuilla) will only work if they are set up exactly the same on both profiles. QuickFolders users can also add this button to the Current Folder toolbar. Find Duplicates This is a button on the quickFilters toolbar in the Filters List which searches for various types of duplicates, such as filters that do the same thing (like move mails to the same folder) or have duplicate conditions. It is a great utility for tidying up unclear filters or even find filters that do unexpected stuff. Local Inbox Option to run filters on Local Folders Inbox automatically. With this new option, any emails that are moved to the Local Folders Inbox will be automatically processed again using the filters defined there. With Thunderbird out of the box this behavior cannot be achieved as there is no "Get new Mail" event on Local Folders. You can activate it on the Pro tab of quickFilters options. You know that you support the project and that the development and support will be continue. There is a huge amount of work involved not just programming and keeping quickFilters up to date but also supporting users, coming up with better ways of doing things, fixing bugs, and keeping quickFilters usable across various platforms and host programs (at the moment I support Thunderbird, SeaMonkey and Postbox). I am constantly helping people with using quickFilters and their mail program and how to get the most out of email on the desktop. All notification messages that indicate premium features are omitted. The donation screen (which is normally shown after every Update) is hidden. There are quite a few software developers (and also some users) who believe that software should generally financed by advertisement or even by selling information about their users. I am firmly opposed to this way of making money as it impacts both productivity and privacy rights; also in the world of Email I would find this way of generating value deeply problematic - even if it was strictly opt-in. There is a lot of personal information in our daily mail and a lot of knowledge that is being stored and retrieved with this powerful tool. quickFilters is an especially powerful set of tools to harness this information and it will evolve and keep saving time and make your experience of mail more meaningful and intuitive.